Chilpancingo de los Bravo ([tʃilpanˈsiŋɡo ðe loz ˈβɾaβo]) (kent as Chilpancingo an aw) is the caipital an seicont-lairgest ceety o the state o Guerrero, Mexico. In the 2005 census, the population o the ceety wis 166,796. Its surroondin municipality, o whilk it is municipal seat, haed a population o 214,219 bodies. The municipality haes an aurie o 2,338.4 km2 (902.9 sq mi) in the sooth-central pairt o the state. The ceety is on Mexican Federal Heich-gate 95 that connects Acapulco tae Mexico Ceety. 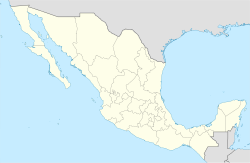 Chilpancingo is whaur the Naitional Congress met in 1813 tae discuss Mexico's futur as an unthirlt naition. On 27 Aprile 2009 an yirdquauk wi a magnitude o 5.6 wis centred near Chilpancingo. This page wis last eeditit on 11 Mairch 2018, at 03:57.